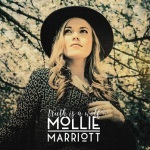 This review’s going to be different from most of the things you’ll read about Mollie Marriott’s album “Truth is a Wolf” in one important way; I won’t be saying anything about Mollie’s musical heritage. You can read about that elsewhere, and I want to focus on Mollie and the superb team she’s created to deliver her musical vision. As a songwriter and singer she deserves to be judged on her own merits (and on the merits of her writing and performing partners) as she releases her debut solo album. The band deserves a special mention here as well. This isn’t an album put together by a bunch of studio hacks; Johnson-Jay Medwik-Daley (guitar), Sam Tanner (keyboards), Henrik Irgens (bass), Alex Reeves (drums) and Izzy Chase-Phillmore (backing vocals) are Mollie’s live band (in various acoustic and electric permutations)and Sam and Johnson collaborate on songwriting as well. In a live setting, it’s obvious that they’re all great players, but equally obvious that they love working together and they’re good mates. The other songwriting collaborators include Judie Tzuke, Graham Kearns and Jim Stapley (one of the best voices in rock at the moment) and to add little spice, there are a couple of non-originals; a storming version of World Party’s “Ship of Fools” (Mollie’s first single, released last year) and the title track, written by Gary Nicholson and Bonnie Hayes. Mollie’s channelled a lot of heartbreak through these songs, including the opener “Broken” which deals with a failing relationship, and “Love your Bones” about the death of a good friend, but it’s ultimately a hugely uplifting album, despite the serious themes. So, how does that happen? There are a couple of reasons; one is Mollie’s huge voice and the other is the incredibly good band. Let’s start with the band. The rhythm section does exactly what it says on the tin (there’s even a few melodic bass riffs thrown in)and creates a platform for the interwoven guitar and keyboard arrangements, which are all beautifully played without ever straying into muso ‘look at me’ territory. The second single, “Transformer” is driven along by Johnson’s infuriatingly catchy, over-driven earworm of a guitar riff while Sam’s smoky keyboard riff is the impetus behind “Truth is a Wolf”. And then there’s Izzy, also a great singer, whose voice works perfectly alongside the lead vocal. And Mollie’s voice? Well, what can I say? She can do the pop singer thing, hitting all the right notes and sounding crystal clear and that might be enough for a lot of people, but there’s another dimension. When she goes up through the gears, she finds a raw emotional edge that only the best soul and rock singers have, and she can move seamlessly between these styles. In putting the album together, Mollie’s written about a lot of painful episodes, but she’s managed to create a superb, powerful album from those episodes. This is an incredibly assured debut album packed with personal, well-crafted songs and technically perfect but often under-stated instrumental performances. This sounds like Mollie’s breakthrough. Oh, and just one more thing, go and see the band live if you get the chance; you won’t regret it. “Truth is A Wolf” is out in February 2016 on MITA Records. This version of the album was withdrawn after the promotion copies were sent out, substantially recorded and released in late 2018. It’s a different album, but still a very good album. You should definitely go and see them live. Where can I pre-order Truth is a Wolf? It does not seem to be listed anywhere. Hi David. I understand that the release date has been put back for some reason. As soon as we know the new release date, we’ll announce it on https://www.facebook.com/theriotsquad/. If you go to that page and “like” it, you’ll get an automatic update as soon as we know the release date. That’s cool – thanks. If Mollie tours the album, please don’t forget us poor country folk up here in the north east of Scotland…. I’m guessing that Mita have released this elsewhere in the world, as there are copies now advertised on Ebay – hopefully get mine soon (can’t wait!). Well – the new album arrived this morning , and it is really, really good. The lady is so talented, and I love it – I new it would be good, but it is so much better than I expected. Very similar in genre to the best Deborah Bonham has done (i.e. The Old Hyde). If the ‘official’ copy has more material on it, then I look forward to it! Thank you Mollie – made my day!